Texas State and UIndy students working together to get the job done. This morning we entered the Sacred Heart Cemetery full of mixed emotions. It was our last day in the field. Our hands were so sore and swollen we had trouble bending our fingers. Our bodies were aching. Sidney was getting sick. We’d been using icy hot, ibuprofen, ice packs and taping our blisters almost every day, but we knew once we got warmed up and moving that we could push through the pain. 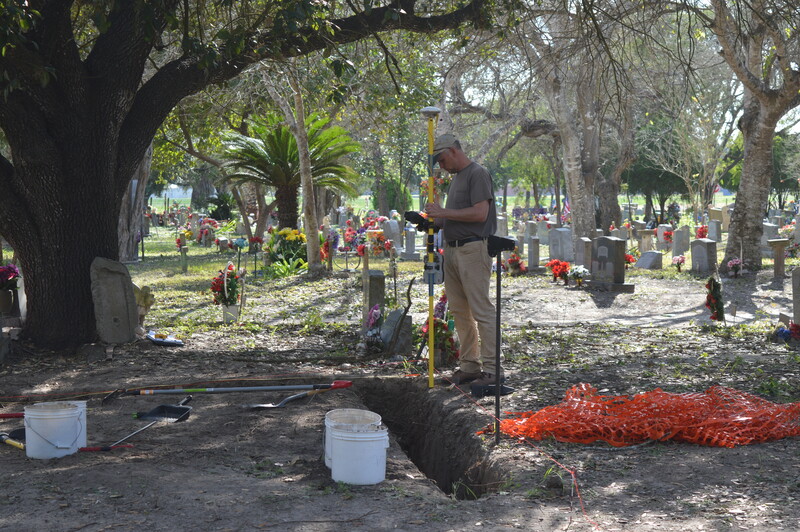 The UIndy team was on our third plot of the cemetery which was almost complete. We were all getting loopier by the day and singing songs that had nothing to do with archaeology as we shoveled and trenched endless mounds of dirt and investigated the area for missing individuals. 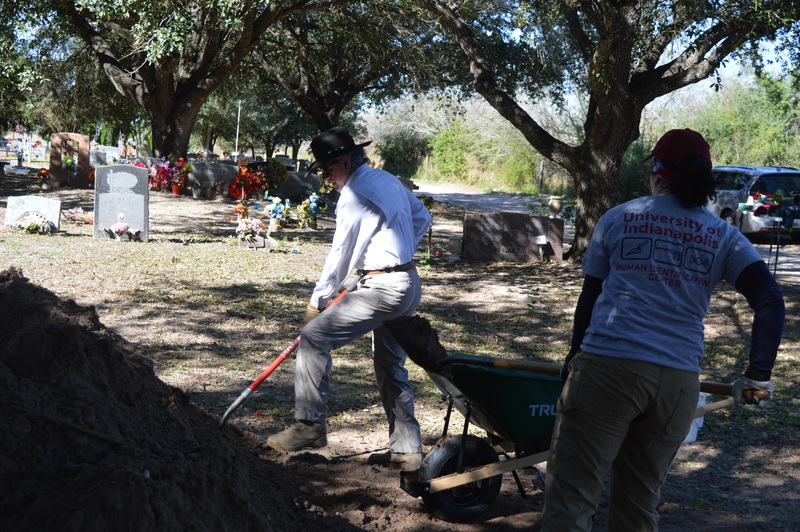 Many of the Texas State students came over and helped us wrap up our final trenches before lunch, which was immensely helpful. We were proud to have met our goals this season and meet some long-term friends and colleagues in the process. This project is truly a team effort and we are all here for the same purpose. 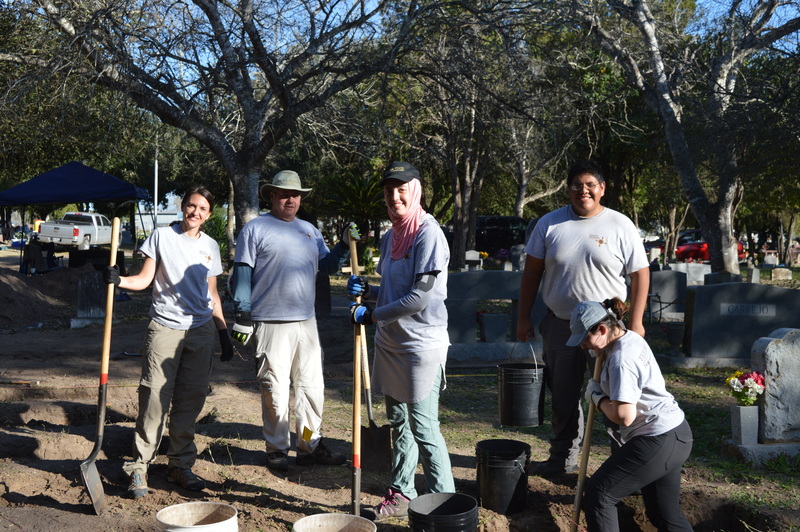 After lunch, we were very fortunate to assist the South Texas Human Rights Center with their water station refills. 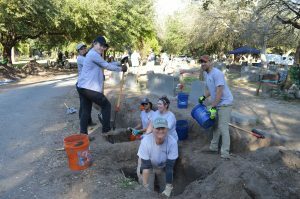 These water stations are amazing tools that aid in the survival of human beings who are on their last leg. Each station consists of a 55-gallon barrel, 6 gallon-sized jugs of water, a post to keep them upright, and a flagpole to indicate their presence from afar. In addition, the Human Rights Center prints instructions on how to contact them and attaches them to each water bottle in case someone is desperate for help. 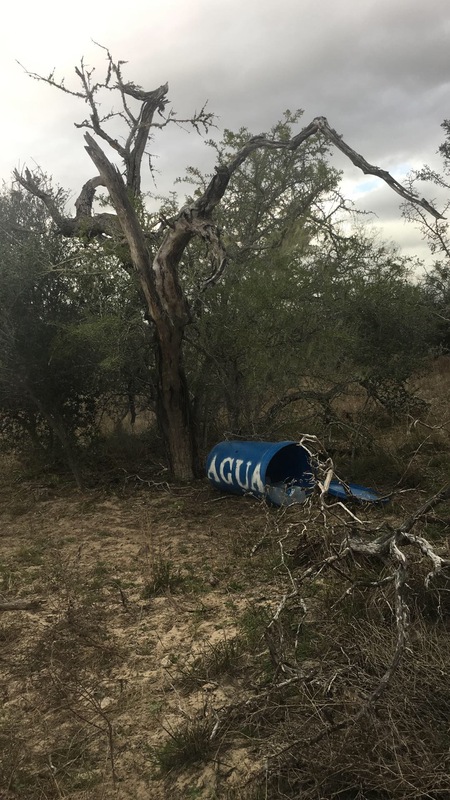 The lids to the water stations also have contact information, and the GPS coordinate of that water station’s location so they can read it to the person they are contacting if they need assistance. Individuals who stumble upon these may have gone incredibly long periods of time without food and water. Many become lost for days in the thick, desert brushlands, but this route is their only option if they want to remain hidden. 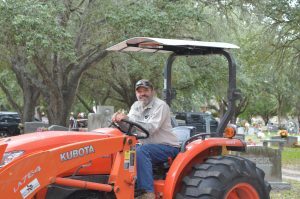 These water stations save people’s lives who may otherwise have be reduced to bone within days in the Texas heat. 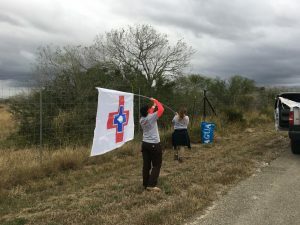 We were all very grateful to have been given the opportunity to participate in this process on our last day in Falfurrias. 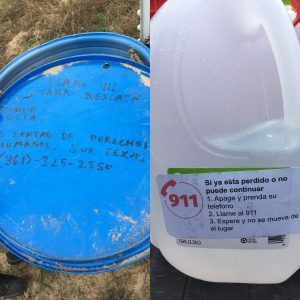 According to their website, the South Texas Human Rights Center currently services 144 water stations each and every week. Arden, Emily and I went with Eddie Canales to refill some stations on the nearby ranches. 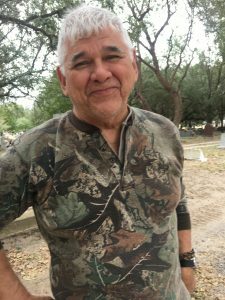 To complicate matters, Texas is almost entirely made up of privately owned ranches that do not allow Eddie to set up water stations on their properties. He informed me that only about 25% of the ranch owners allow him to do this work on their property. In addition, water jugs may spoil and water will leak out rendering them useless. Sometimes he finds them with intentional punctures or damage from people who disagree with helping the migrants. Angela and Sidney servicing water stations. Eddie, Arden, Emily and I got to see two ranches with about four water stations each. 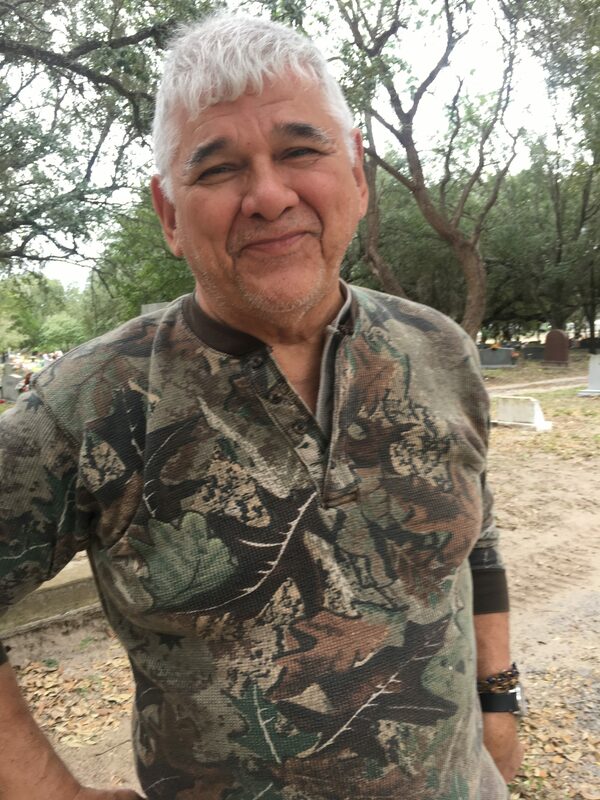 Eddie Canales is an amazing person and it was so much fun to spend time with him as we did this. It was fascinating to hear about his daily experiences as the founder of the Human Rights Center and year-round resident in the area. We also spent quite a bit of time laughing while we bounced around in the backseat of Eddie’s 20-year-old 4×4 truck while we navigated sandy terrain to reach the water stations we intended to fill. 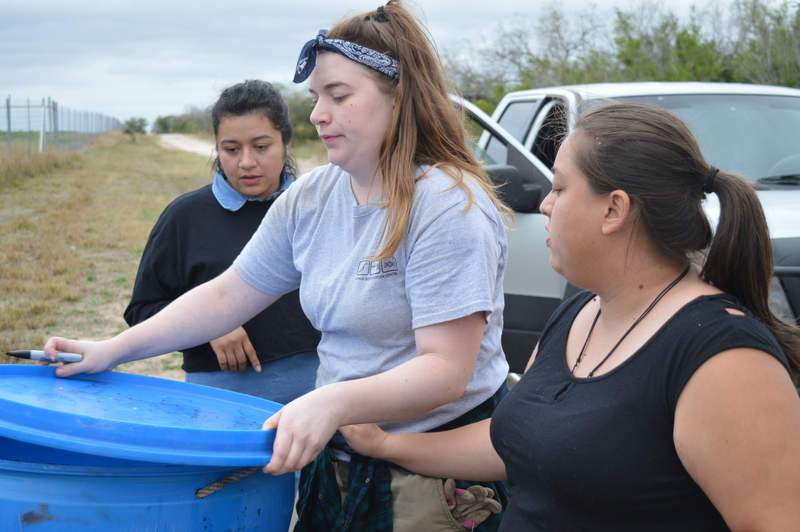 Angela, Sidney and Dr. Latham went with Selina and Arianna (two other members of the South Texas Human Rights Center) to fill water stations on a different route. In many ways, nine days in the field seems like a long time digging, but it was so much more than that. 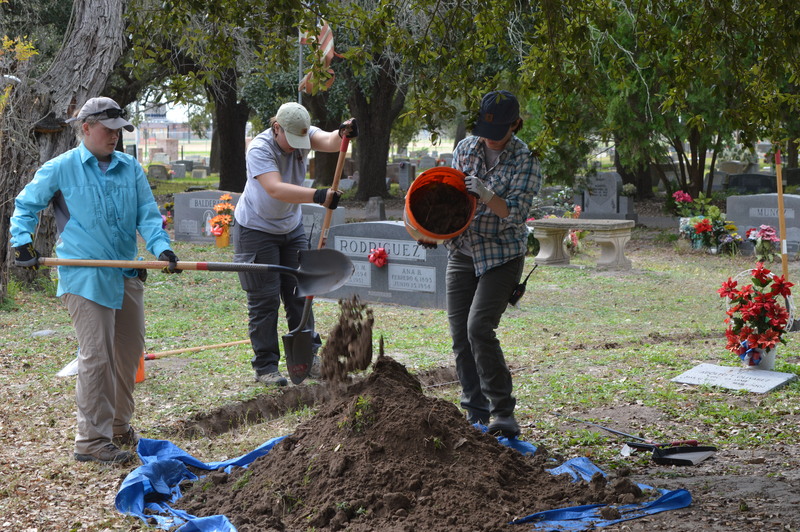 We do not solely feel passionate about digging in the dirt. We feel passionate about the humanitarian work that is being done here and feel a duty to continue assisting in the identification of the voiceless and deceased. 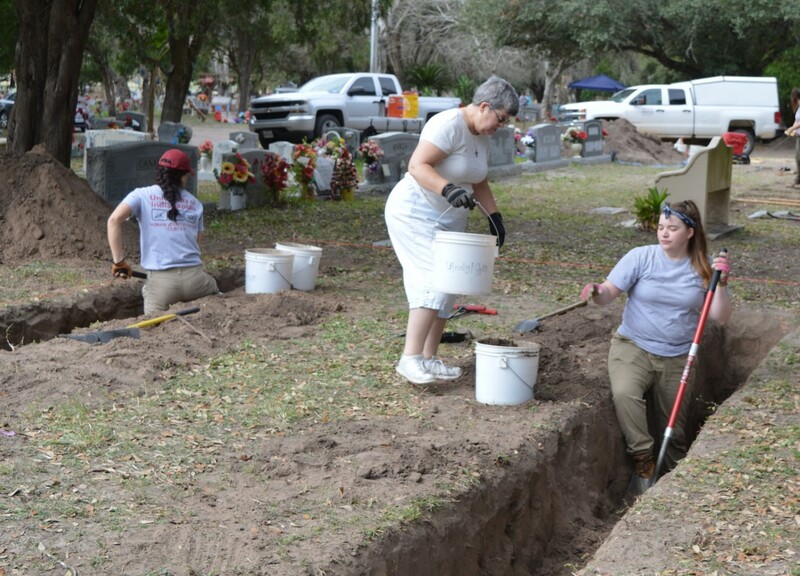 We feel passionate about helping family members find out where their loved ones might be. Anthropology in the U.S. encompasses a multifaceted approach that includes cultural integration, and I feel that this experience has really shown me the importance of that approach. 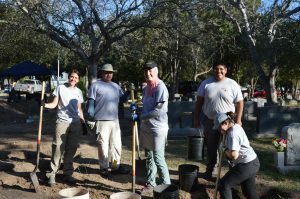 I am grateful to have been able to participate in a mission in which we work closely with people from different walks of life that have a common goal at heart. 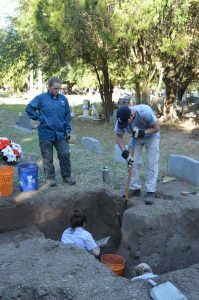 This large scale migrant identification project requires the cooperation of many entities at every level of the forensic investigation, including the exhumations. 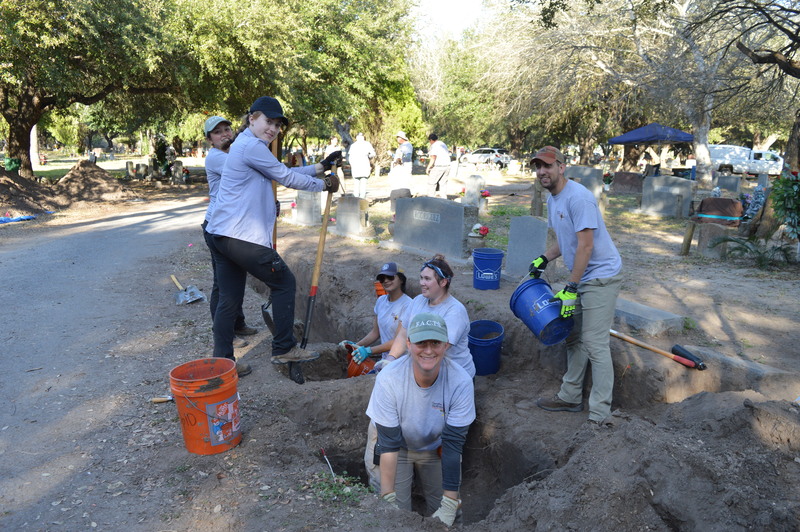 Not only are many groups coming together to work within the cemetery, but the completion of each unit and sub-section is a group effort. 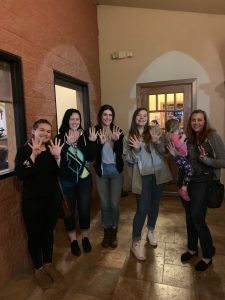 While the Beyond Borders blog focuses mainly on the efforts of the UIndy team, we want to make sure that we highlight some of the other individuals that are instrumental in these identification efforts. 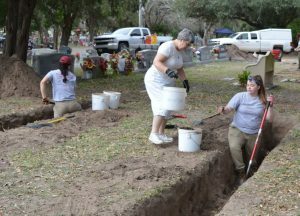 Please see Operation Identification to learn more about the work being completed by Texas State University. 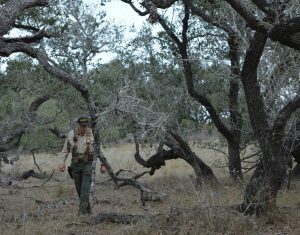 Please see Remote Wildlands Search and Recovery to learn more about the work being done by Deputy White. Please see the South Texas Human Rights Center to learn more about initiatives to save lives along the border. Day 8: Some pretty awesome ladies! Today was day eight. I cannot believe that we only have one day left. 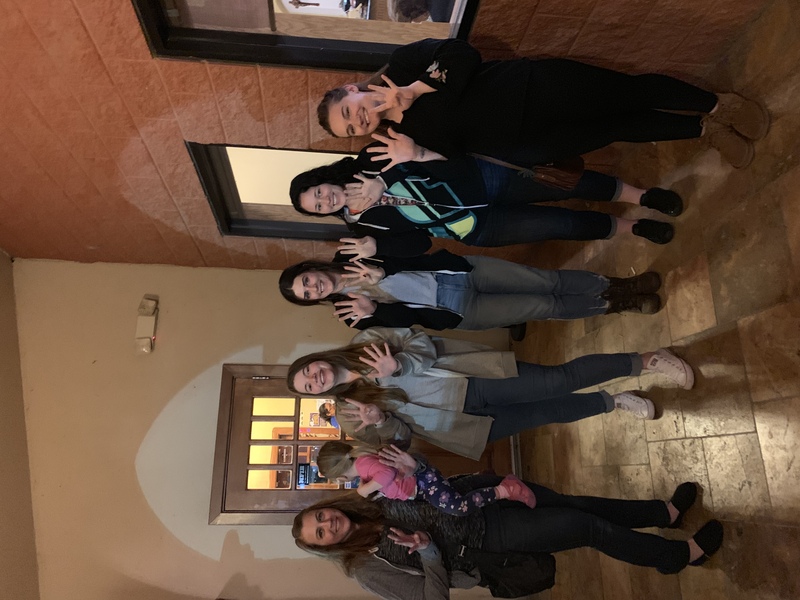 It has gone by so fast, and I am very thankful that we write these blogs in order to reflect and remember everything that we have done from day to day. It is hard for it not to all blur together when we have done so much in the few days that we have been here. 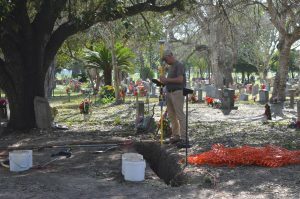 We continued trenching our site today and were really shocked at how much progress we made. 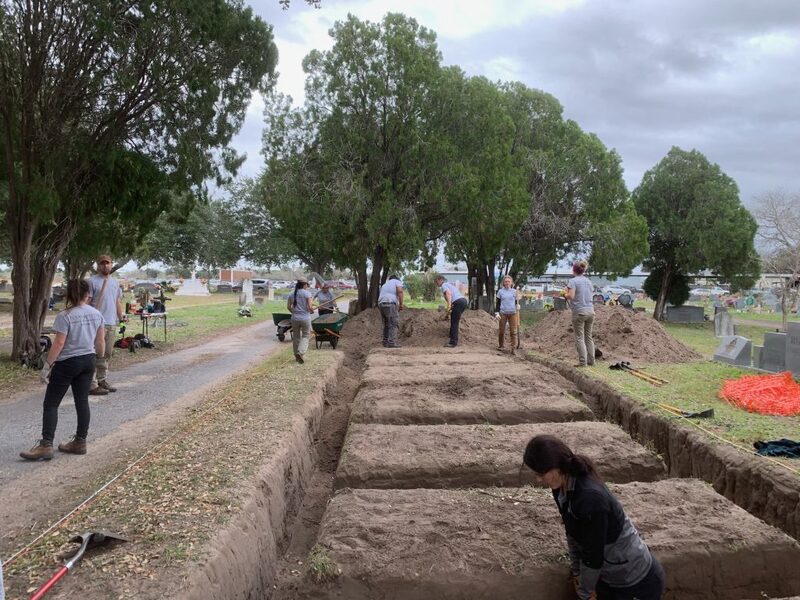 With two hours left we made it our goal to complete two more trenches, yet we finished those and began 4 more trenches before the end of the day. 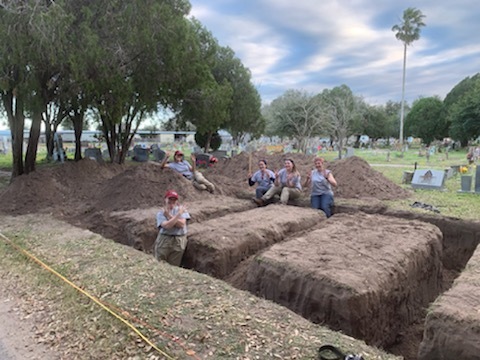 I think that I say this in every blog but I am very proud of how much dirt we have moved, how much area we have cleared, and the positive attitude that remains within our team. We are some pretty awesome ladies if I say so myself! 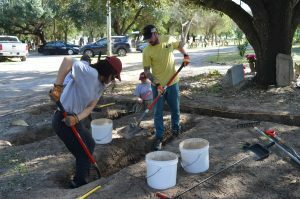 Today I had a unique experience of helping the Texas State team leads with intake. 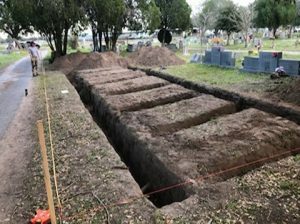 This is where we open up the body bag, coffin, patient belonging bag, etc. 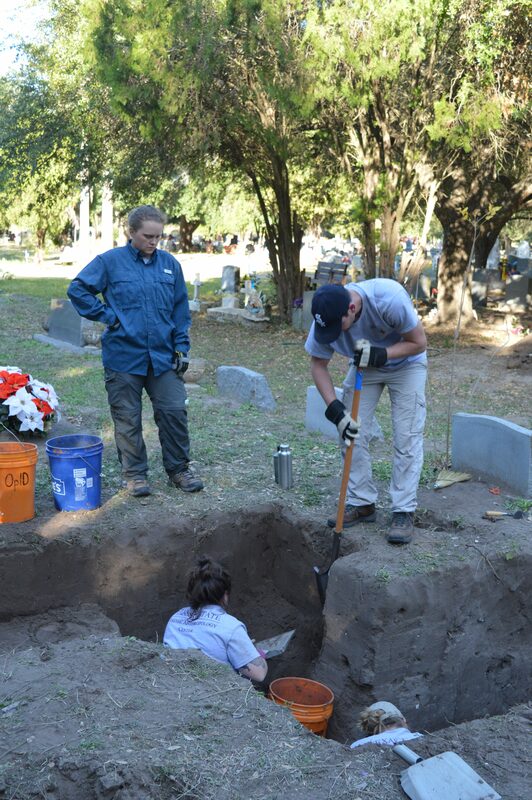 that exhumed, unidentified remains were found in and record how many and which bones were accounted for. If there is any writing on the bags or identifying features/belongings, that is recorded as well. Photographs are taken, and the bags are sealed up ready to be sent to the Texas State Labs for analysis. It was interesting to be a part of, as our team has not yet exhumed anyone or participated in this process so far this season. 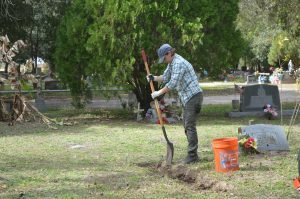 Sister Pam came to the cemetery today – she is a catholic Nun who has helped in previous field seasons and is a huge supporter of our project. She drove 23 hours all the way here from Ohio to be able to see us this season, which we could not believe. 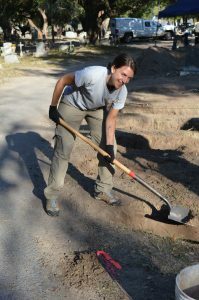 She greeted us all with warm hugs and a kiss on the cheek before proceeding to put gloves on and help us move dirt. After all of the stories I have heard before meeting her today, I was not at all surprised. She was hauling buckets better than I could. She is exactly the type of woman that I would like to be later in life – stubborn, determined, and strong. 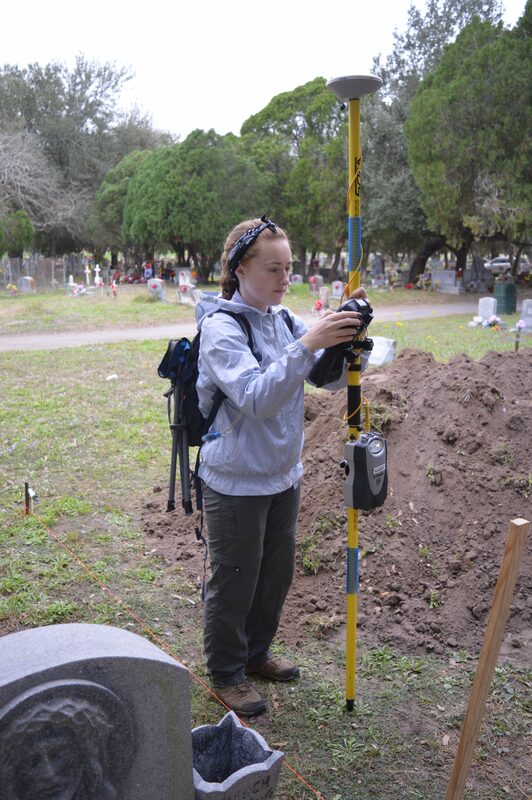 It was nice to hear her talk to Dr. Latham about previous students she has met while helping with exhumations. Asking what they are doing now and so forth. Most of them have moved onto PhD’s or highly regarded jobs, many on the basis of what these exhumations have taught them and what experiences they have gained from them. It made me feel very lucky to be where I am, getting into the dirt with Sister Pam just like others have done before me. She is one cool lady, let me tell you! 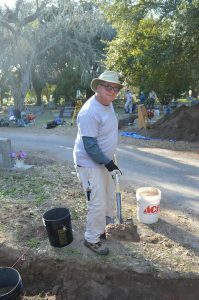 Dr. Cate Bird was on site today. 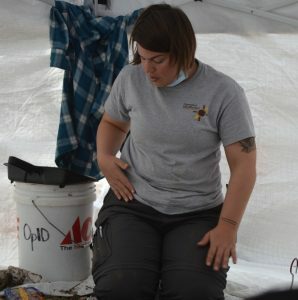 She is a forensic specialist working for the International Committee of the Red Cross. Which for many of us here – is a dream job. She is a supporter of our project and is going to report back to Washington D.C. on the work that we are doing here in Falfurrias. She has been with us for a few days and has been kind enough to make the rounds to all of our teams to chat and see what progress we are making. She was so kind to buy everyone popsicles on site today. It was such a kind gesture in the peak heat of the afternoon, to get us all together for a refreshing treat. 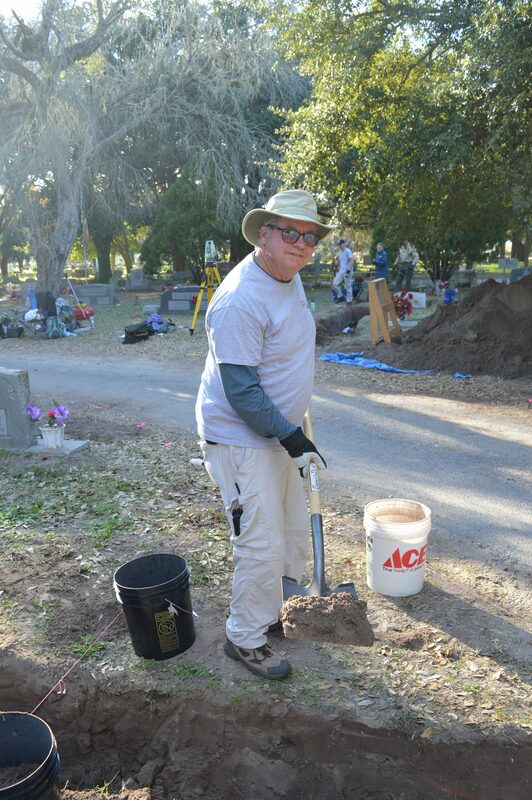 Thank you, Dr. Bird, for being yet another example of what we can aspire to be in our field! I’d like to end this post today with some things which have been on my mind the last few days. Right now, there is a government shutdown on behalf of President Trump due to concerns with border security. It is a bit surreal that we are here… at the border, exhuming unidentified migrants, visiting the border “wall”, participating in search and recovery with Border Patrol, donating to the Humanitarian Respite Center, meeting very nice people who are here to seek asylum, and working with people who are so passionate about this side of immigration that you do not see on the news. We are seeing a humanitarian crisis that is different from what many may know. It is humbling, and it is important. We are here to do what we can to promote social justice and I am very proud of that. Thank you for reading along! 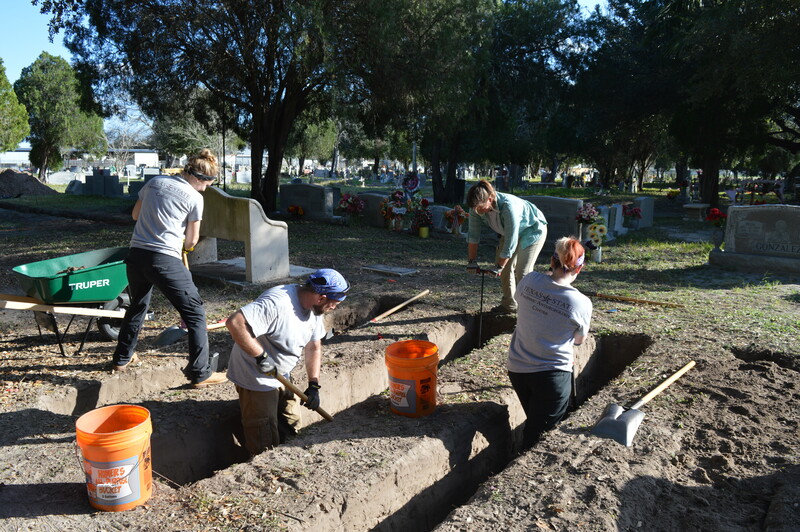 We will be seeing you again tomorrow, where you can read about our last day of digging. Bittersweet!